Alix Bowman explained the process by which the vehicles are assembled. The aluminum chassis is manufactured by one company. The plastic shell of the vehicle is made of TRYLON and is a thermoformed – a process by which plastic is heated to a pliable forming temperature, and then sucked by a vacuum into a given shape. Two days ago the company shipped out nine Elf vehicles to buyers up and down the East Coast. Alix wheeled an Elf out of their manufacturing facility onto the city sidewalk. I hopped in and received instructions showing me he controls of the vehicle. I loved hearing that the vehicle has two independent drive chains, so that you can pedal power the vehicle at the same time the electric motor is engaged. I took off down the sidewalk in the gorgeous downtown of Durham. There was very little traffic on the streets on a Sunday morning, so I had the streets to myself as a traveled around the block. I quickly developed a routine of using the electric motor to get me rolling and then powering the vehicle primarily with the pedals. Even with the nice plastic frame surrounding the vehicle, I could feel a slight gust of wind in my hair (singular). The ride was exhilarating, even for the short duration of the test run. I could visualize myself enjoying a ride out in the country in an Elf. 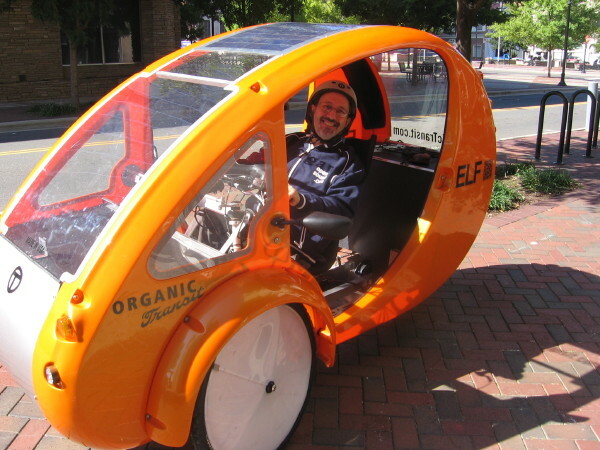 Biking in an Elf is so much fun, it could get more Americans moving. I sure hope Michelle Obama goes out for a ride in an Elf sometime. The Elf invention itself points at a hopeful zero emission vehicle future. It feels like intercity bicycle powered buses – assisted with solar-powered electric motors – are coming closer to a reality with each passing year. Maybe one of Elf’s offspring might be a bicycle powered intercity bus. 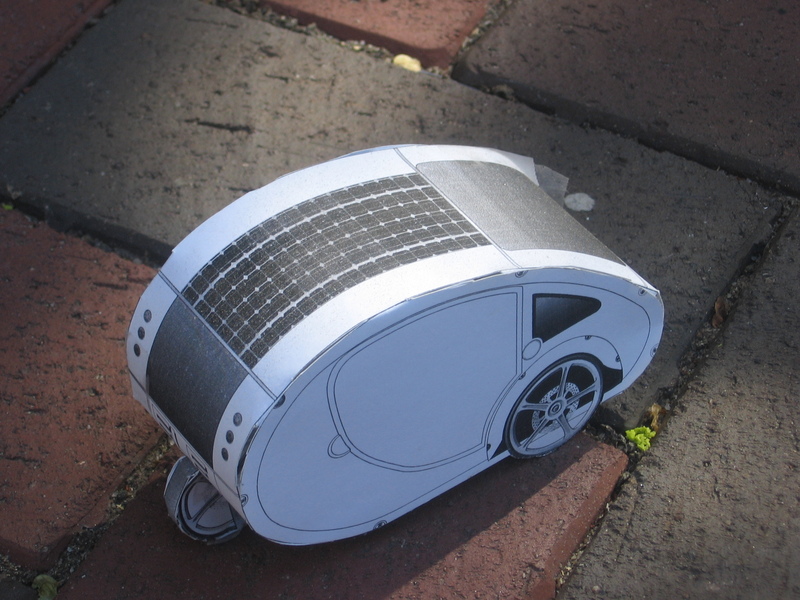 As I was leaving Organic Transit, Alix Bowman showed me this very cute paper model of the Elf velomobile. You can create your own model using this PNG graphics file. 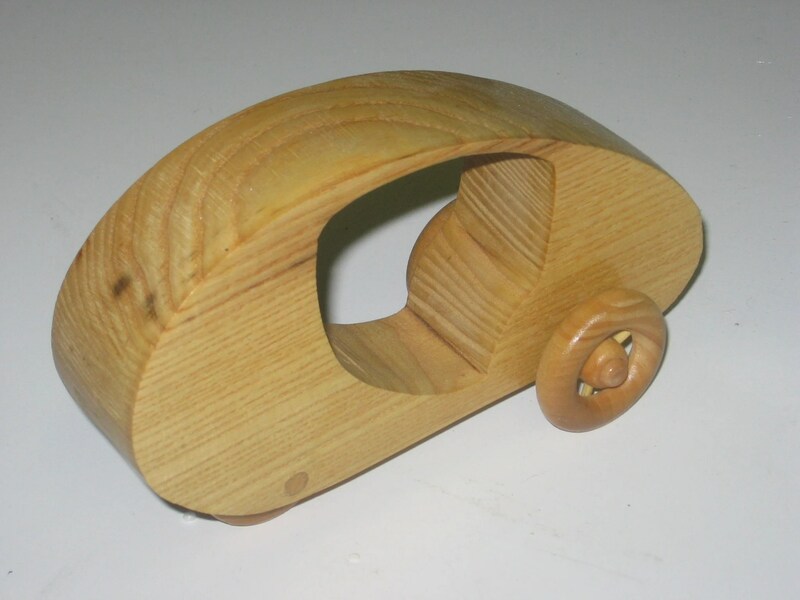 Meanwhile, this wooden model of the Elf bears an uncanny resemblance to a toy car I used to own as a kid. Maybe that’s the brilliance of this invention: Organic Transit has taken a child’s toy and scaled it up to be a usable, fun, highly efficient vehicle for adults. I’m rooting for the Elf. It’s the vehicle the world has been waiting for.